Welcome back! 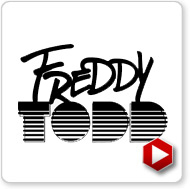 We wanted to have someone special to roll out our 75th episode, and wrap up 2012. Who better than Freddy Todd? His most current release, Sick in the City, Alive in the Woods just came out via our friends over at Adapted Records. The whole album is a constant challenge to what Glitch Hop "is". His versatility and constantly evolving style make him hardly the type of producer that you can label as being in this genre, or that genre. Freddy also has another recent free EP, Gourmet Everything also out on Adapted Records with previous Memekast selector, Mr. Bill, featuring remixes from Circuit Bent and our own resident, Tha Fruitbat. The next year and beyond is looking huge for Freddy. He was just added to the ever expanding roster at Circle Talent Agency, where he joins the likes of Excision, Datsik, EOTO, Dieselboy, Noisia and a huge list of other world class talent. Thanks again for listening, and Happy New Year!